On the Castle Series Finale episode, "Crossfire," Castle and Beckett, who have spent all of Season 8 hunting a mysterious and deadly entity known as LokSat, are ready to take a stand, and take LokSat down. They finally have a good lead, thanks to informant Caleb, and it's time to act. But their lead takes them directly into a trap, from which they barely escape. Then, Castle is captured and brought to a CIA black site, where he's drugged, and forced to give up the names of the people who know about LokSat... everyone he loves! Just as Castle is about to die, Ryan and Esposito lead a team of NYPD officers into the building and save him. But Beckett is still in danger, and Castle must pull out all the stops to find her and save her life. Read this Castle recap to find out how it all went down, and how Caskett finally get their happy ending. 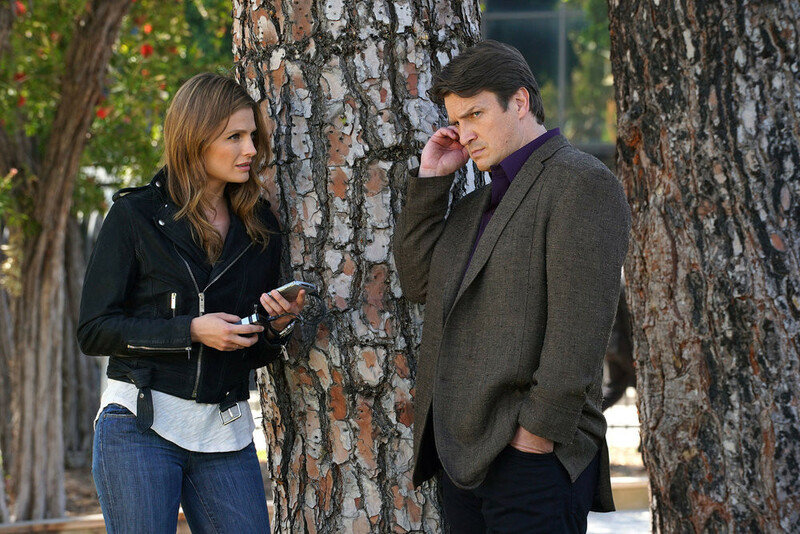 Castle and Beckett think they're about to expose LokSat, based on evidence from their informant, Caleb. But instead, they realize too late that they've walked right into a LokSat trap. Castle and Beckett are taking heavy fire, unable to call for help, and they're out of ammo. Just when things are about to get ugly, Mason Wood (Gerald McRaney), the head of the Greatest Detective Society in Los Angeles, bursts onto the scene (in a Korean BBQ truck) and saves their lives. Beckett is immediately suspicious, because it's a little too convenient. How did Mason know just when and where to show up and rescue them? That's when Mason reveals he's a friend of Castle's stepmother, Rita, and she sent him to help. Watch: Castle and Beckett Are Trapped! Castle & Backett Are Trapped|Castle and Beckett walk right into LokSat's trap.|Castle and Beckett think they're about to expose LokSat, based on evidence from their informant, Caleb. But instead, they realize they've walked right into LokSat's trap. Castle and Beckett are taking fire, unable to call for help, and they're out of ammo. Just when things are about to get ugly, Mason Wood (Gerald McRaney) bursts onto the scene (in a Korean BBQ truck) and saves their lives. Watch this scene from the Castle Series Finale episode, "Crossfire." At the eleventh hour, Vikram decides Ryan and Esposito need to know about LokSat. Beckett isn't happy, because she was trying to protect her detectives from getting involved in the conspiracy, which could lead to their deaths. But now, she has no choice but to read them in, and of course they will insist on joining the fight, no matter what the danger is. Castle finally gets to meet the man behind the LokSat conspiracy. He's shocked to learn it's someone he already knows, Mason Wood! Mason, the man who, hours earlier, rescued Castle and Beckett from the LokSat trap! Mason isn't hiding his identity any more, and proceeds to interrogate Castle to find out who else knows about LokSat, so he can kill them too. Castle has been drugged by Mason's right-hand man, with a truth serum, and no matter how hard he fights, he confirms that everyone he cares about, from Ryan, Esposito, and Hayley, to Martha and Alexis, knows about the conspiracy. Castle is devastated, knowing he's just sentenced them all to death. Beckett figures out that Mason is LokSat, but she didn't count on the electromagnet in the ceiling of his kill room, which effectively disarms her. Mason has his (plastic) gun trained on Beckett. Before he takes the shot, he informs Kate that her husband is dead, and his body is burning in the furnace behind her. She's heartbroken, but refuses to go down without a fight. Suddenly, Castle bursts into the room, aiming his gun at Mason, until it too is snatched away by the powerful magnet. Beckett takes advantage of the distraction to take Mason down. Then she runs into Castle's arms. Richard Castle couldn't have written a happier ending than Caskett's. But first, the hard part: they both get shot, in their loft, by double-crossing informant Caleb. Ouch, that's got to hurt, on many levels. But even though it looks grim for our favorite mystery-writer-turned-private-eye and his muse/soulmate, better things are in store. Fast forward seven years into the future, when Castle and Beckett are deliriously happy and the proud parents of three adorable children. Rick and Kate get their "always." Castle and Beckett work together take down the shadowy villain behind the deadly LokSat conspiracy, on the Series Finale episode, "Crossfire." Watch more Castle videos, see the Best of Richard Castle, the Best of Kate Beckett and watch the full episode of the Castle Series Finale, "Crossfire," now! Castle stars Nathan Fillion as Richard Castle, Stana Katic as Kate Beckett, Seamus Dever as Kevin Ryan, Jon Huertas as Javier Esposito, Molly Quinn as Alexis Castle, Susan Sullivan as Martha Rodgers, Tamala Jones as Lanie Parish, and Toks Olagundoye as Hayley Shipton.